This weekend’s Greater Pangasinan Celebration kicked off Will Graham’s two-week evangelistic tour in the Philippines. Special outreaches to youth, law enforcement and business people will take place this week, as well as a Samaritan’s Purse Operation Christmas Child shoebox distribution at a Manila orphanage. On Feb. 15-17, Will Graham will preach the Gospel at the Metro Manila Celebration. They sprang from their seats and streamed forward. Children and teens, parents and grandparents. Will Graham had just shared the Gospel and given them the opportunity to surrender their lives to Jesus—and they weren’t going to miss their chance. Over the two-day Greater Pangasinan Celebration, nearly 7,000 people said yes to new life, hope and freedom with Jesus Christ. This number represented almost 20 percent of the 35,300 who attended Celebration events. 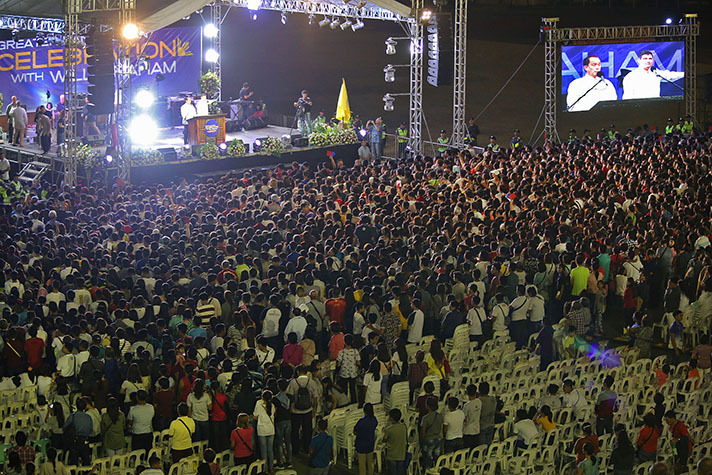 The evangelistic outreach kicked off more than a week of Gospel preaching, which will culminate with the three-day Metro Manila Celebration with Will Graham, Feb. 15-17. It is a bustling area, with bridges spanning marshes and ponds. The streets are crowded with roadside markets, pedestrians, dogs, motorbikes with side cars, and the ubiquitous Filipino Jeepneys (rebuilt and elongated—and often beautifully painted—jeeps that carry several people at a time, a form of mass transit that became popular following World War II). In a place where many people are “religious,” Will Graham’s messages focused on man’s sinful nature and our eternal need for a relationship with Jesus Christ. As the stands continued to empty Sunday and thousands responded to the invitation to begin a relationship with Jesus, Myra Jalique looked on with awe. A pastor and missionary, she served as the liaison for the Celebration, working closely with the local government. Do you have peace with God? Pray now.